This month’s Faith on Tap will take place this Thursday - our speaker will be the Dominican, Fr. Lawrence Lew OP. His talk is entitled ‘Is our liturgy focussed on God or man?’ There is an opportunity for discussion and questions are very welcome. Last month’s was a great success. Please come along. Please make a note in your diary. The Solemnity will be celebrated with a Solemn Mass at 7.00 pm on Friday 12th June. Damian Howard, Lancaster Cathedral organist will play. Fr. Mark McManus, Dean of Chesterfield will preach. There will be a reception following the Mass in the Parish Centre to which all are invited. Please note the time of Mass on Thursday. Fr. Michael will be travelling to Glasgow for a spiritual recollection for priests. Monday to Wednesday 10.00 - 2.00 and Sunday 12.00-3.00 pm. For more information contact the centre manager Trevor Tiffin on 524295. The class resumes this Thursday evening. Parents of children are reminded that attending Mass on Sunday is an essential part of the preparation for First Holy Communion. Classes continue on Wednesday evening at 5.15 pm in the parish room at Christ the King. Booking forms are now available for the pilgrimage to Rome. The pilgrimage will take place from Tuesday 17th May 2016 returning home on Monday 23rd May. Price will be £759 including flights based on two people sharing and will be half-board [breakfast and evening meal] in a hotel situated near St. Peter’s Basilica. There will be an optional excursion to Assisi on the Saturday of the pilgrimage. Please send booking forms directly to Tangney Tours before the deadline of 30th June 2015. A detailed itinerary will be distributed prior to departure but the pilgrimage will include attending the Papal Audience and Angelus. Could God be calling you to build up His kingdom by helping others to be formed in the faith? The parish needs willing and able volunteers to assist in the field of catechesis. We have a strong First Holy Communion team but we’re looking to introduce programmes for Baptism, Confirmation and Marriage from September. Please pray about this as the future of the parish very much depends on individual parishioners willing to help others to deepen their faith through this essential formation. Pope Francis declared that a Year of Consecrated Life be celebrated throughout the world. A local Celebration will take place on Saturday 13th June beginning with Mass celebrated by Bishop Michael Campbell. This will be followed by a buffet and presentation in The New Waterton Hall, Warwick Square. Mass begins at 12.10. You are all warmly welcomed to attend. For further details please contact Sister Maureen on 01228541541 or Sister Moira on 01228538550. The Parish Centre is hosting a quiz in aid of families affected by Muscular Dystrophy and Strokes on Monday 15th June at 8.00 pm. We have a parish cricket club and new members are always welcome to join. Please see Luke Denny or Michael Merrick. Games are held over 18 overs on a Wednesday evening. A festival is being held at High Wray on the shores of Lake Windermere between 3rd and 5th July. £20 a pitch camping, vans, caravans. Limited places so book now to avoid disappointment. See Paul Lovell. 07788 818535. The Cor et Lumen Christi community, St Cuthbert's The Old Convent, Wigton CA7 9HU, invites you, 19-21 June. Come and find all that God has prepared for your masculine heart. See the flyers in the foyer. A formation workshop offered by the Office for the New Evangelization for altar servers of all ages. Saturday 18th July in the New Waterton Hall 10am to 4pm. The cost will be met by the parish. Any servers interested in attending please see Fr. Michael. St. Margaret Mary Primary School raised £200 for the recent CAFOD appeal. Education Conference at Austin Friars. A conference on Catholic education organised by a parishioner, Michael Merrick, will be held on Saturday 27th June. It may be of interest to governors of our primary school. For more information please see Fr. Michael or Michael Merrick. Thank you for your offering last weekend which totalled £707.40 Attendance was 238. Monday to Wednesday 10.00 am - 2.00 pm and Sunday 12.00 - 3.00 pm. For more information contact the centre manager, Trevor Tiffin on 524295. Catechesis continues this Thursday. There are now 15 candidates for First Holy Communion - please keep them in your prayers. First Holy Communion will be celebrated during the 11.00 am Mass on Sunday 14th June. Parents of children are reminded that attending Mass on Sunday is an essential part of the preparation for First Holy Communion. Those who would like their mission boxes emptied or those who would like mission boxes, please contact Alison Hather at St. Margaret Mary. A good number have responded to the suggestion for a pilgrimage to Rome in 2016. Booking forms should be available shortly. the witness given by a child’s father that is most influential in this - so pray for dads! Have you ever wondered what God’s plan is for you? Have you ever thought that God may be calling you to serve his people as a priest? If your answer is yes to one or both of these questions, then why not contact the Vocations Team and begin to discover what God’s plan is for you. Contact Fr. Darren Carden – priest@lancastervocations.org/Tel: 01772 719604/Mobile 07552795060 or Fr. John Millar – jwmillar1@gmail.com/Tel: 01228 521509. Thank you for your response to the appeal last weekend. You can continue to give via the Disaster Emergency Committee - http://www.dec.org.uk | 0370 60 60 900 | or at your own bank. Our diocesan residential youth centre, Castlerigg Manor, Keswick, is hosting a Family Weekend: 22-24 May. Cost: £75 adult/£50 child. More information from 01768-772711 or e-mail team@castleriggmanor.co.uk. The parishes of St. Bede’s & St. Edmund’s have arranged a pilgrimage to the shrine of Our Lady near Preston, on Tuesday 26 May. Cost approx. £13; coach will leave St. Bede’s Church at 8.00 am, returning around 6.00 pm. There will be a talk on the Shrine, Mass, prayer before the reliquary of the Catholic martyrs and some private time, before travelling back via Keswick where you will have an hour or two free time. Please bring a packed lunch. If you’d like to go, please phone Fr Jim on 521704. Please make a note in your diary. The Solemnity will be celebrated with a Solemn Mass at 7.00 pm on Friday 12th June. Damian Howard, Lancaster Cathedral organist, will play. Fr. Mark McManus, Dean of Chesterfield, will preach. Fr. Michael is part of the team inspecting Christ the King High School in Preston on Wednesday and Thursday this week. As a result of this, there will be no public celebration of Mass in the parish on these days. Sorry for any inconvenience this may cause. Meet on Thursday evening at 7.30 pm in the Parish Centre. Thank you for your offering last weekend which totalled £623.16 Attendance was 219. Monday to Wednesday 10.00 am - 2.00 pm and Sunday 12.00-3.00 pm. For more information contact the centre manager, Trevor Tiffin, on 524295. Meets this Tuesday at St. Margaret Mary’s - all are welcome to come along. The group meets at 7.30 pm. 7.00–8.00 pm, Wigton, St. Cuthbert. 5.00-6.00 pm, Appleby, Our Lady. 10.30-11.30 am, Penrith, St. Catherine. 6.00-7.00 pm, Carlisle, St. Augustine. 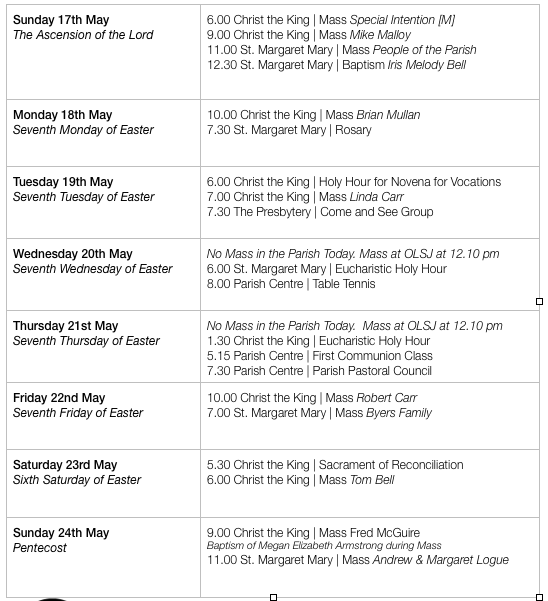 6.00-7.00 pm, Christ the King. 6.00-7.00 pm, Carlisle, St. Edmund. 6.00-7.00 pm, Carlisle, St. Bede. 7.00-8.00 pm, Wigton, St. Cuthbert. 9.00-10 am Penrith, St. Catherine’s. 3.15-4.15 pm Carlisle, Our Lady & St. Joseph. 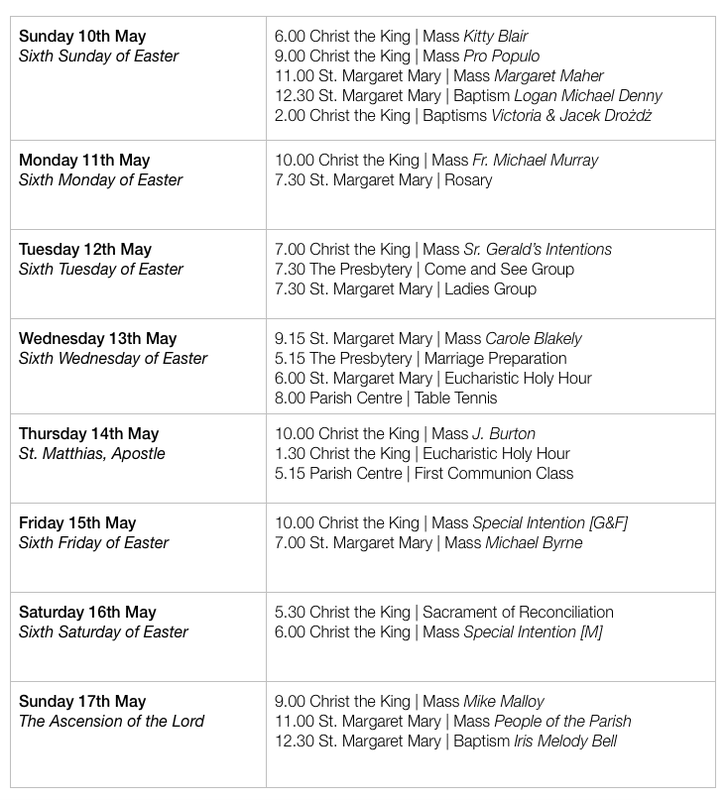 11.00 am Mass on Sunday, 14th June. For those of you who would like their mission boxes emptied/would like mission boxes, please contact Alison Hather at St. Margaret Mary. Parishioners are still attempting to ‘book a Christening’ via the telephone. Parents should attend a Sunday celebration of Holy Mass and then meet Fr. Michael in person. It is still the expectation when baptising children there is some hope that they will be brought up as practicing Catholics i.e. that they will grow up knowing that being at the Sunday celebration of Mass is a normal part of being a Catholic: how can they do that if their parents are not attending? Studies have shown that it is often the witness given by a child’s father that is most influential in this - so pray for dads! The six sessions for those preparing to be married in the parish this year will begin in the Presbytery this Wednesday at 5.15 pm. Two weddings will be celebrated in the parish this year. Have you ever wondered what God’s plan is for you? Have you ever thought that God may be calling you to serve his people as a priest? If your answer is yes to one or both of these questions, then why not contact the Vocations Team and begin to discover what God’s plan is for you. Contact Fr. Darren Carden – priest@lancastervocations.org Tel: 01772 719604/Mobile 07552795060 or Fr. John Millar – jwmillar1@gmail.com Tel: 01228 521509. Could God be calling you to build up His kingdom by helping others to be formed in the faith? The parish needs willing and able volunteers to assist in the field of catechesis. We have a strong First Holy Communion team but we’re looking to introduce programmes for Baptism, Confirmation and Marriage from September. Please pray about this as the future of the parish very much depends on individual parishioners willing to help others to deepen their faith through learning. CAFOD has launched a £3m emergency appeal following the earthquake in Nepal. Thousands of people in this already impoverished country have been killed and many thousands more are in urgent need of food, water, shelter and emergency supplies. 8 million people are affected. CAFOD is responding with Church partners and has deployed a team to provide specialist support. There will be a retiring collection this weekend in support of CAFOD’s appeal. You may want to give via the Disaster Emergency Committee - http://www.dec.org.uk | 0370 60 60 900 | or at your own bank. The parishes of St. Bede’s & St. Edmund’s have arranged a pilgrimage to the shrine of Our Lady near Preston on Tuesday, 26 May. Cost approximately £13; coach will leave St. Bede’s Church at 8.00 am, returning around 6.00 pm. 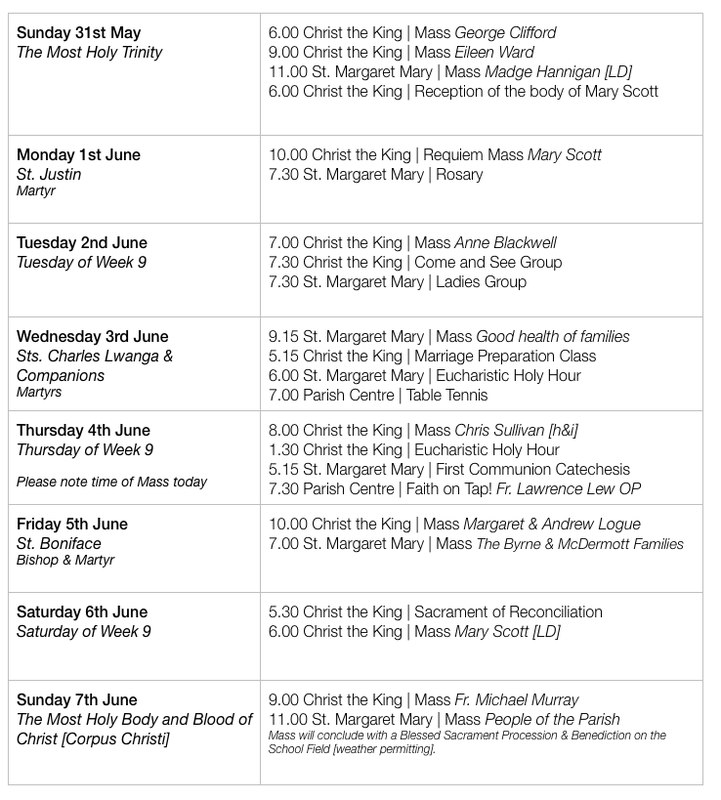 There will be a talk on the Shrine, Mass, prayer before the reliquary of the Catholic martyrs, and some private time, before travelling back via Keswick where you will have an hour or two free time. Please bring a packed lunch. If you’d like to go, please phone Fr Jim, 521704.